Many people approach car shopping in the U.S. looking for the largest, most luxurious vehicle they can afford, from the best brand possible. Still, at least a handful of shoppers are more focused on basic transportation--and a vehicle they know they can afford. My daughter Priscilla falls into the latter category, and she recently set off on one of life's great adventures: buying her first car. MUST SEE: Natural Gas For Long-Haul Trucks: Which Version Makes More Sense? Living in a dense suburb of Boston with limited parking, she preferred a small car, but felt strongly that she needed to be able to carry four adults on a trip without feeling cramped. Options were not a priority: Crank windows and manual door locks would be acceptable, though an AUX input jack for the stereo was a necessity. Also, she preferred a stick shift--which was also useful in keeping the cost down. Prices ranged from about $12K to $16K, quite low compared to today's average new-vehicle selling price of about $30K. ALSO SEE: Tesla Model S Electric Car: What Has Changed Since 2012? Over the course of three weekends, she and I went and drove each model, allowing back-to-back impressions of the various vehicles. She eliminated some vehicles right on the spot at the dealership. The Ford Fiesta was judged to have too little rear seat room, and she found the motorcycle-style instrument cluster on the Chevy Spark too off-putting--so it too was rejected. And the Toyota Yaris just felt hopelessly uncompetitive, with an unappealing dashboard layout and manual door mirrors that required opening the window to adjust them. The Toyota dealer didn't help matters by providing a salesman unfamiliar with the different vehicle models, never mind the features of each one, to try to sell us a car. On the positive side, the Mazda 2 was great fun to drive and offered adequate rear-seat room. It certainly lived up to its Zoom Zoom marketing, particularly in the row-your-own manual gearbox version. The Nissan Versa Note (hatchback) was nice to drive and had much more rear-seat knee and headroom than any other vehicle in the list, even the roomy Honda Fit. 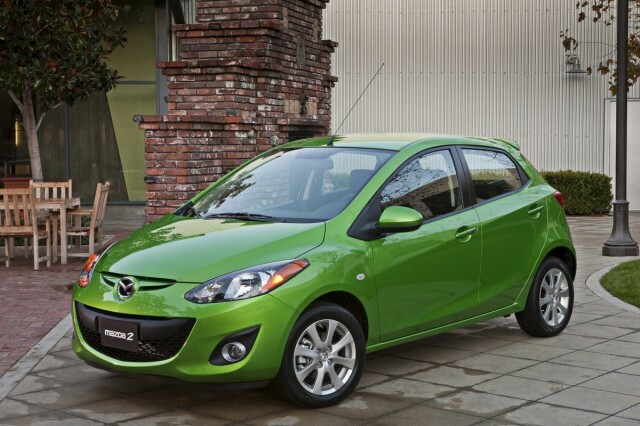 But both the Mazda 2 and the Versa Note were dropped from consideration: The Mazda because other cars offered a better dollar value, and the Versa Note because it was too similar to the Fit, which was a better overall vehicle with a solid reputation. 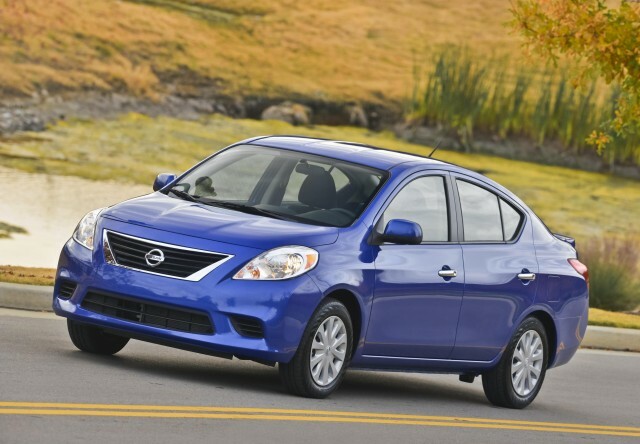 By the third weekend, a short list had emerged: Honda Fit, Mitsubishi Mirage, and Nissan Versa S sedan. Each vehicle was compelling in its own way, though there are significant differences among them. The Nissan Versa S may be the lowest-priced car in the U.S., at $11,900, but that model is a bit of a unicorn. It took a lot of effort to find a low-cost version of the sedan with manual shift. Everything about the Versa S was "good enough." With crank windows, manual door locks, an all-black dashboard, and a rear seat that didn't even fold down, the Versa S is a very basic car. But my daughter felt it drove fine, with adequate acceleration and handling. There was really nothing wrong with the Nissan Versa sedan--although we suspected it might be a difficult car to fall in love with. READ: BMW, Tesla Are Only Electric-Car Makers 'To Build A Business': Really?? 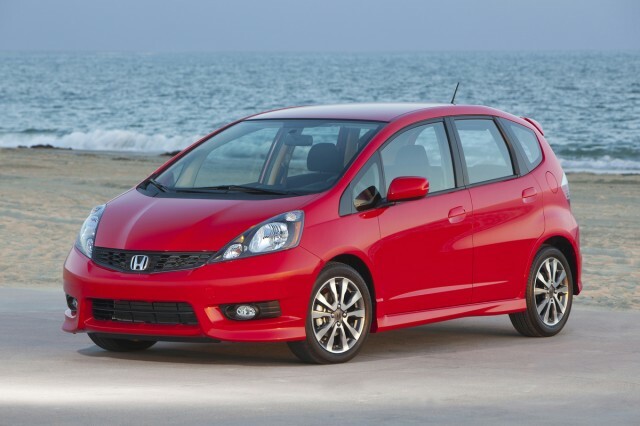 Without considering price, the Honda Fit is clearly the vehicle of choice among this group. With power windows, power door locks, a USB port, and its astoundingly flexible "Magic Seat" fitted even to the base model, the Fit is relatively luxurious. 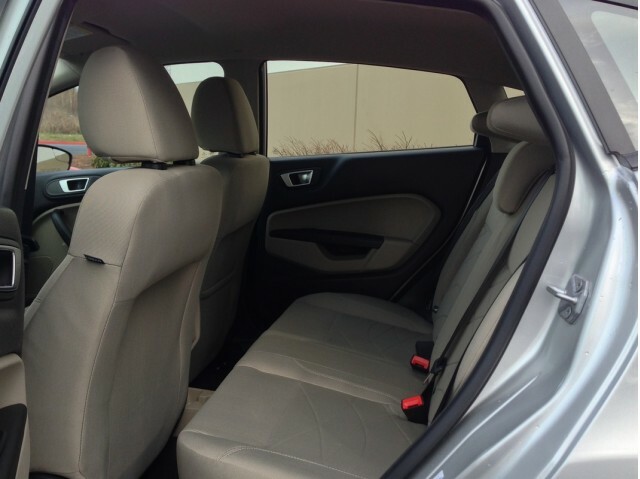 Its rear seat knee and head room is excellent, and the multiple ways to fold the rear seat makes it clear that the Fit would be a champion in any hauling competition. But at nearly $16,000, the Honda Fit could be best thought of as "more car, more money" compared to the others on the list. 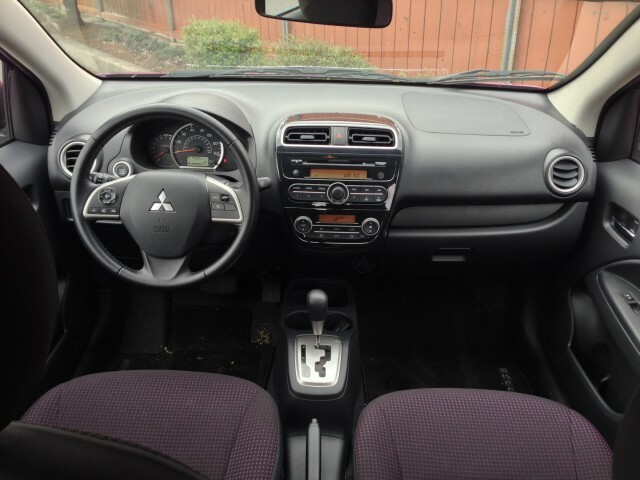 The surprise hit of all these vehicles was the Mitsubishi Mirage, which is marketed as "A New Breed of Fun!" Marketing hyperbole aside, the manual-shift Mirage proved to be a lot of fun. Although it has only three cylinders producing a not-very-whopping 74 horsepower, the engine has just 1,973 pounds to move around--meaning that acceleration onto the highway was more than adequate. The sound coming from the 1.2-liter three-banger engine does take some getting used to. It isn't exactly "loud," but it has more growl when accelerating from a dead stop than any other vehicle tested. But its fuel-sipping nature and an EPA rating of 37 mpg combined (34 mpg city, 42 mpg highway) means my daughter would be spending significantly less at the pump than she would have with some of the other small vehicles. While light cars may raise safety concerns among fathers like me shopping with their daughters, the Mirage received good ratings in IIHS testing (except for the new small-overlap front crash test) and it has seven airbags. With an MSRP of just $12,995 on the base model, the Mirage offers a lot of value, including power windows, power mirrors, power door locks, and USB connectivity. 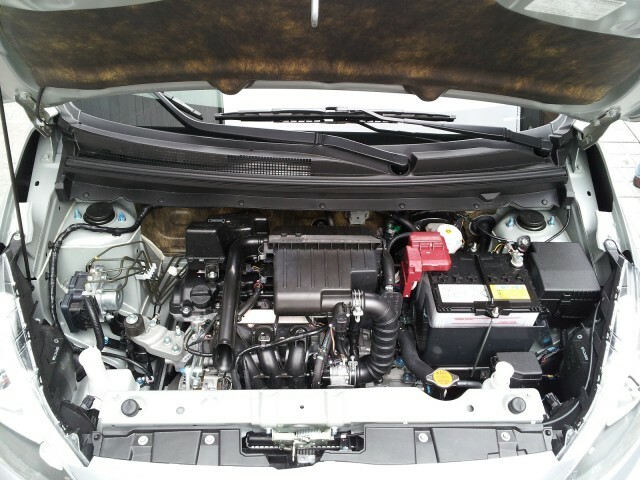 It even has automatic climate control on the base model, a very luxurious feature on the second or third least-expensive vehicle in the market. The rear-seat knee and head room is a little tight for my 6'1" frame, but at 5'10", my daughter fit fine in the back seat even with the front seats all the way back. Rear cargo space is very limited, hardly surprising in a vehicle fully a foot shorter than the Honda Fit. In the end, her decision came down to the Honda Fit versus the Mitsubishi Mirage--and that all-important consideration of money. The Honda Fit is undoubtedly the better vehicle to drive and haul with. And Honda's reputation for reliability is a strong incentive to stick with a better-known brand. But the Mirage, already much less expensive, came with $1,000 of factory cash, putting its final price about $4,000 lower than the Fit's (depending on how negotiations went). 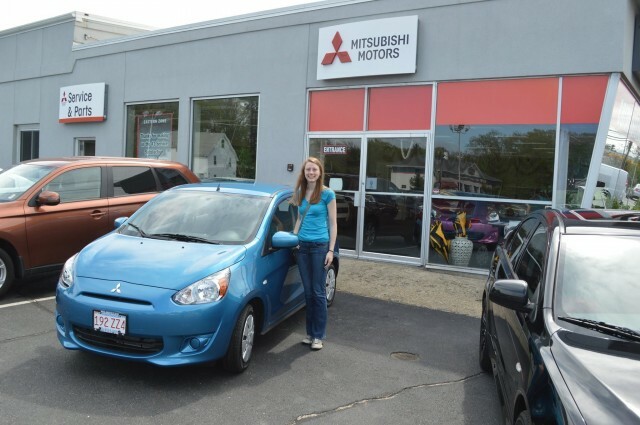 My daughter took delivery of her beautiful blue 2014 Mitsubishi Mirage last week at a price (before all the additions) of just $11,995. The sale shows it's possible to get a new car in America, with more features than you might expect, for far less than you might predict--even as your friends continue to look for the largest, most luxurious, most prestigious vehicle they think they can afford.